No, really. I don't run for the sake of running. I don't do treadmills (any more). I don't bike on stationary bikes. I don't elliptical. I play ice hockey once a week between September and April, and I play ball hockey anywhere between 0-3 times a week, depending on my work and personal schedules. 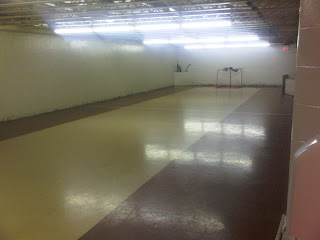 I'm attaching a picture of the actual ball hockey court we have at work. Yes, at work. In the basement, along with a well-stocked gym (dual stack universal, power rack, bowflex and some cardio junk, dumbells, etc) and showers / change rooms. In a nutshell, we're spoiled and it's one of the many reasons that I've stayed with my employer for almost 9 years now. It's quite long and it fits 3 by 3 (and goalies) for ball hockey nicely. On days when we're short a couple of guys, we play 2 on 2 and that's a wide-open run. See? We're spoiled. What I'm going to get to is that I can play down here for over 2.5 hours, almost without a break, and I can keep going for more. THIS is what a MuscleHack-built person is capable of. If I was so inclined, I'm sure I could run a 5-10K without thinking too hard about it. Probably a half-marathon if it moved me to. You get all the cardio you need doing a proper MuscleHack workout. I'm living proof of that. Sounds like you are doing tons of cardio playing hockey. Some weeks I'd agree with you. Some weeks I get almost no cardio (illness, injury, scheduling, travel, etc). I've actually cut down on my ice hockey (from 2 games a week consistently to 1 almost every week) and my ball hockey schedule is more erratic than predicting global economy recovery numbers. It's a pain wanting to play sports so often and still wanting to pack on muscle mass! Final Winner Announced - "MuscleHack for a Day"
Nutrition find of the week! Week #2's second winner gets a HIT workout! Another great HIT cycle workout! Draw #2 - winners announced!